Fifteen years ago, Will Ferguson set off to walk the Ulster Way. At almost 1,000 km, it was the longest of the U.K.’s National Trails. Beginning in Belfast’s northern suburbs, the Ulster Way looped around the six counties of Northern Ireland before returning to the south side of that city. Like most walking memoirs, Ferguson battles his own unpreparedness, his heavy backpack (he was carrying four changes of clothes! ), and the elements–mostly the constant rain, which turned walking across a moor into wading across a bog. What makes this memoir different is the fact that Ferguson was walking through a country riven by sectarianism, despite the signing of the Good Friday agreement in 1998. He gets to know people on either side of the divide–some are kind, others are frightening–and so as readers we get an outsider’s perspective on Northern Ireland and its troubles, or The Troubles. The other thing that distinguishes this memoir is the fact that the Ulster Way was, at the time, almost entirely notional. Waymarkers were few (and often incorrect), and his guidebook was largely inaccurate, written by an optimistic soul who had never actually walked any part of the Way. At one point, he finds himself looking for a path that was ploughed under by a local farmer more than 40 years before. The scrupulously accurate Ordnance Survey maps, which record every building and telephone booth, were also useless, because they typically led Ferguson into bogs or farmyards guarded by vicious dogs. So Ferguson often finds himself walking alongside highways–a dangerous activity given the narrow roads and the speed of traffic. It’s not fun. In the book’s epilogue, Ferguson notes that the Ulster Way was relaunched in 2009–allegedly with better waymarking, although from the maps I’ve seen it still leads walkers into peat bogs. It’s no longer considered a complete trail, either; instead, there are “quality sections” through mountains and hills, linked together by roads. Walkers are now advised to take public transit from one “quality section” to the next. I wonder if the relaunch has made much difference; after all, footpaths have to be used if they’re going to stay alive, and part of the problem with the old Ulster Way, according to Ferguson, was footpaths falling into disuse. 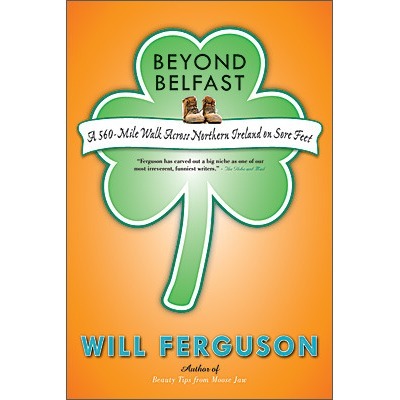 Ferguson is a Giller Prize-winning author, and Beyond Belfast is funny, if repetitive. I’m glad I read it, if only so that I can stop wondering if the Ulster Way is a something I’d like to try. I don’t think so. Too much rain, too much mud, too few places to stay. It’s a pity, really, because according to Ferguson parts of the country are spectacularly beautiful–when the sun’s shining, anyway. 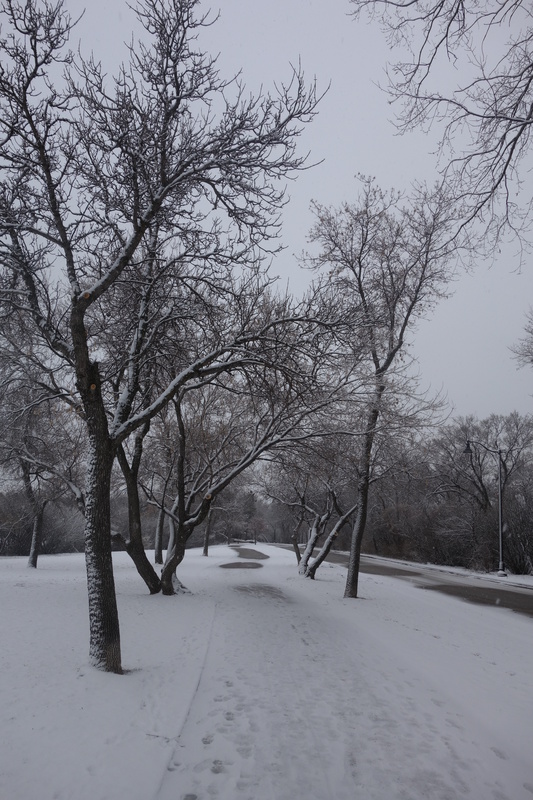 It might be the first day of spring but it was snowing this morning when we walked to the campus. That’s okay. The snow was pretty and most of it has already melted. The sun even came out this afternoon when we were walking home. What else could you ask for? Because of the early spring, the ice that made sidewalks and pathways treacherous has melted away, so we went for a walk this afternoon. The usual route: around both sides of the lake with a stop for coffee three-fourths of the way through. We bumped into our friend Knud on the far side of the lake and then met our friends Risa and Barbara at the café. We all sat together outside. A terrier was tied to the other table and when Risa tried to make friends with him, he shook with fear and cold. Then we went to the opening of a show at Mata Gallery, just up the street, and then home. A lovely afternoon. I had intended to bring my camera along but forgot to. Maybe next time. The weather has turned sunny and warm–warm by the standards of a Saskatchewan winter, that is. What a pleasure it was to walk to work this morning, despite the treacherous, icy sidewalks. I even saw a downy woodpecker hammering away at an ash tree. Is that a sign of spring?